That's the rhetorical salvo Michael Moore fires across the bow of those who would diminish the value of women. 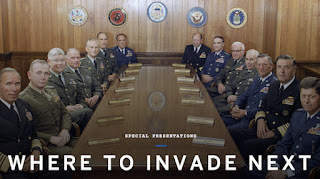 It's only one of several issues Moore “advances on” in his new documentary of provocation that comes in plenty of time for what's left of the 2016 presidential campaign: Where To Invade Next. The person who utters that remark in the movie is the first woman to ever be elected president of a sovereign nation on planet Earth. That nation is Iceland. Moore and his film crew also invade ... or rather ... visit other nations: Italy, France, Finland, Portugal, Norway, Slovenia, Germany and Tunisia. Other societal issues Moore engages are: employee/boss relations, how to best educate children, and having more humane prisons and healthier sexual attitudes. Moore is always the imp in his movies. He travels to these countries to garner information in order to make life better for citizens back in his native USA. In one way or another, the filmmaker/host plants an American flag as he exits each country and seems on course to take back what he's learned, then apply it to his home state of Michigan and the other 49. The twist, which isn't really a spoiler at all, is that every good idea that he seemingly discovers in each nation was conceived in the United States of America. Imagine that. That would put the conclusion of Where To Invade Next in solid agreement with Donald Trump. What? Is Michael Moore also wanting to make America great again? Not on your life. His solutions are more than just a few light years from what El Donaldo is suggesting these days on your TV screen. Egad ... this must be a documentary that's feeling some kind of, uh … what would you call it … bern? 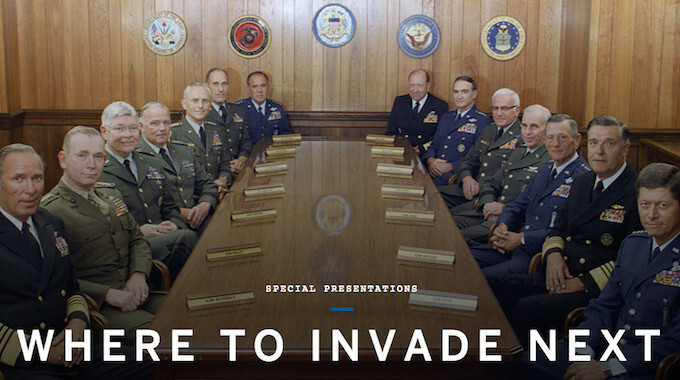 \Where To Invade Next is surely a motion picture that will be a soothing balm to all progressive and liberal-minded people who see it. Therefore and clearly, it also means anyone seeing it who's but a mere inch or so on the south downside of being a middle-of-the-road moderate will hear chalk loudly scratching at their blackboard as they glare out their window at the long parade of “lazy” folks breezing along on that fun expressway without so much as a toll booth in sight. Michael Moore comes off as America's most loved-hated provocateur. He's very effective at putting his argument before us. There is more long term wisdom in his work than there is whimsy. Personalities of the left in the USA don't come close to getting time equal to that allowed for people on the wing extending to the right. Michael Moore should be heard and seen more often … like Thom Hartmann, the radio talk show guy and anchor of an afternoon cable discussion program. How long Moore's new movie plays in any town will depend on how many go see it. I suggest you get a party of your friends and go take a look at Michael's new piece of well produced and well written cinema. And while you at it, say him a little prayer or make a wish for him, whichever is your way of living your life. Word is he's recently been in intensive care, quite ill with pneumonia. Remember, Michael Moore ain't as young as he used to be. Guys like him need to live long lives. Please don't ask me how to pronounce the name of the former female president of Iceland.